Music playing while people took to their seats was incorporated into the show as the curtains opened and a puppet playing the accordion was revealed. Music was used throughout, alongside the verse, which added an element of magic to the movement of the puppets. Some of the poems were sung, which added another level of entertainment for the children. A Child’s Garden of Verse managed to create a piece full of variety. They used string puppets, shadow puppets, and even punch and Judy style puppets. 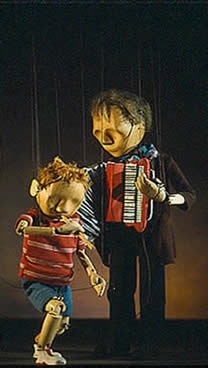 Their parody of a seaside puppet show demonstrated beautifully the nuanced movements of their string puppets, as a comparison to the comic movements of the miniature show. The different scenes presented to us were also astoundingly diverse. We were taken from the Sea to woodland, from an insects’ tea party to a building block town. This kept both children and adults alike captivated. The verse used, although possibly too complex for children to understand, was phonetically pleasant to listen to. The puppets acting out the stories ensured that no one got lost and all present knew what was going on. Some of the verses chosen had clear moral messages, and these reminders are often helpful for both the children and adults, especially when so fluently expressed through the puppets. The stage was often bathed in blues and purples, the lighting helping in the build up of atmosphere. The whole affair had a sense of enchantment and mystery about it that often caused gasps from the children. Glowing mushrooms would rise out of the stage, and puppets of water witches and the wind, although eerie, kept the children in raptures. The shadow puppets, too, looked like something of enchantment. The shapes were delicate and filled in with bright colours, which gave them a subtle beauty. They were also capable of being moved in a life-like way, shown as insects and mice scuttled across the scene. Review written by Rebecca Skinner.